Schrodenger’s Cat – Wanted Dead & Alive at Snorgtees. Return of the Thin Man was a nice read. The further adventures of Nick, Nora and their dog Asta, the book consists of two novellas that Hammett wrote specifically to be adapted into the screenplays for the first two Thin Man sequels, “After the Thin Man” and “Another Thin Man”. These stories seem more like first drafts of screenplays than actual novellas as they’re written in present tense and there’s not a ton of description. 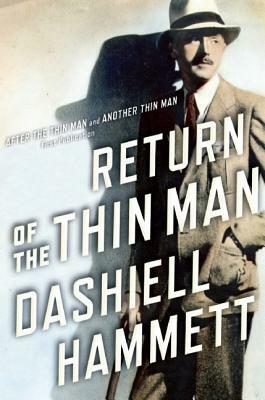 However the dialogue is razor sharp and the balance of mystery and comedy that Hammett exploited in the first Thin Man novel is successfully maintained. The comedy comes from both the ultra-cool, witty characters of Nick and Nora Charles as well as situations stemming from Nick’s lowbrow detective past coming into conflict with Nora’s stuffy old money friends and relatives. Hammett also has a lot of fun with Asta, the dog who chews on both scenery and clues. I recommend this book if you liked the Thin Man novels or movies. Shorty after I finished reading this, Turner Classic Movies had a Dashiell Hammett night and showed “After the Thin Man”. It was fascinating to see that this novella mostly survived the transition of being adapted into a screenplay and then filmed. Some minor plot points were changed but most of the situations and dialogue that Hammett wrote faithfully made it to the screen. At this point in his career, Dashiell Hammett’s best work was fading fast in his rear view mirror but even mediocre Hammett is better than a lot of the choices in the bookstore today. This isn’t nearly as good as The Maltese Falcon or Red Harvest or the original Thin Man novel but it is an excellent way to spend a couple hours. Free feline fiction for Labor Day! If you have a Kindle or the Kindle app and you’re in the mood for some cat literature please click on the link at the right and check out “Petectives”. Phone case with an image of a cartoon woman feeding pizza to a real cat. Ceramic ashtray painted and shaped like a cat’s head.